The easiest, most affordable way to locate venture capital. 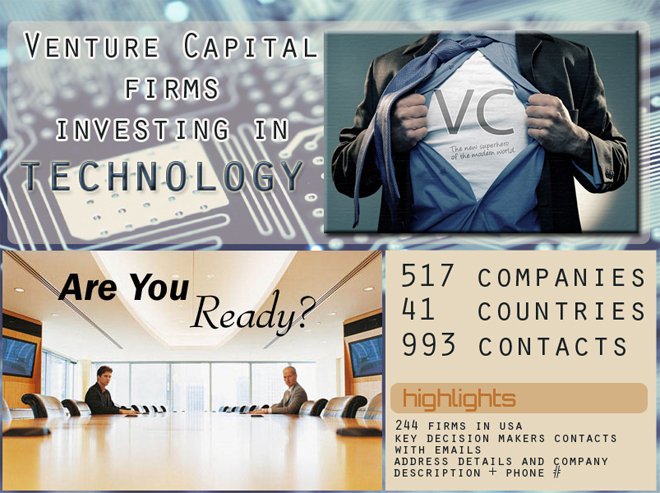 Venture capital database with complete profiles of 517 venture capital firms investing in technology sector worldwide. 8. Key Contact / Decision Maker such as CEO, Managing Director, CFO, Investment Manager etc. It is the most reliable, up-to-date and affordable venture capital directory of its kind. - 517 firm listings located in the US (244), UK (49), Germany (32), France (23), India (23) and many more ….